Ever since I was a little girl I have had my sights set on going to Oxbridge for University. After years of positive reinforcement from my teachers, family and friends about how intelligent I am, it was always something I just expected to happen. However, after a rocky few years and a huge drop in my own self-esteem, I was very close to not even putting them down as a choice on my UCAS application. It was a very last minute thing, as I decided to put an application in for Cambridge for Modern & Medieval Languages (French & Italian) only a couple of weeks before the early applicants deadline. I hadn't spent ages tailoring my personal statement to impress them so I wasn't really expecting much, but I knew if I didn't apply that I would be disappointing little 7-year-old me. You can probably imagine how surprised I was to get an email from Queens' College asking me to send over 2 essays for them to read, and then a few weeks later another email inviting me for interview there! It didn't feel real and I was so shocked I had made it this far into the application process. So, on a cold Tuesday in December I made the 5 hour train/tube/train journey from Cardiff to Cambridge with my mum. We checked into a hotel and then went straight out to explore the beautiful city as darkness fell. 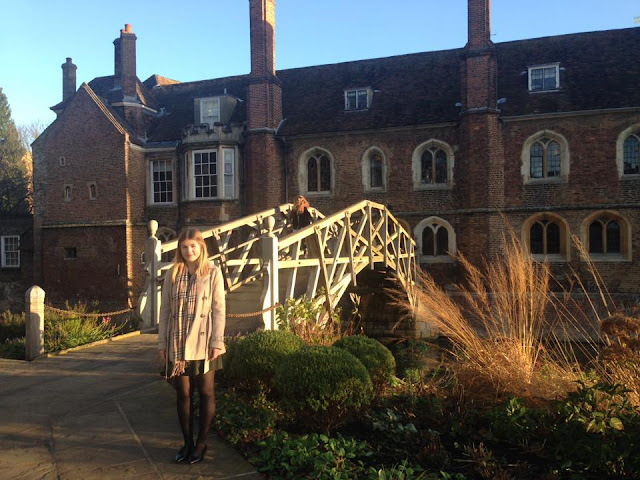 We walked up to Queens' and had a little snoop around, and the lovely porters let us go inside the college grounds. It felt absolutely magical! On the way back we had the most gorgeous dinner in a fancy Italian restaurant, which really finished the evening nicely. I slept really badly the night before my interview and woke up tired with a bad back and I had also caught a cold! It really wasn't the ideal situation for one of the biggest days of my life. We got a taxi up to Queens' and signed in, then waited for my first interview. I had two interviews, one for French and one for Italian, and then a test in which I had to write an essay in French and one in English. As I will be studying Italian ab initio, the interview was mostly about languages in general and why I am interested in studying them. The French interview was more difficult as I had to talk for a short while in French and analyse a French text. However, I came out of both interviews feeling I had done my absolute best and could do absolutely nothing more. The written test was quite difficult as I hadn't known the topic prior to it and therefore didn't have all of the vocabulary I needed, but it still went alright. When I left I was absolutely wiped out and almost fell asleep in the taxi back to the hotel! We then had to go through the 5 hour journey all the way back home, which wasn't very pleasant at all. I felt an overwhelming sense of pride that I had survived the interview stage of the Cambridge application process without any tears or mental breakdowns, as it is known for being particularly grueling. Now it's just a waiting game until January to see if I have been successful in getting an offer to study at Cambridge! Those words feel so weird to actually type, it feels like a dream! I wish you all the best luck! Well done for even applying because I know how badly a knock of confidence in education can shake you terribly. Whatever happens, you will know you did the absolute best and you should be proud of even getting an interview for Cambridge. I live near the city, and it is a stunning area. Wishing you all the best! Awesome!! I wish you good luck but I'm pretty sure you've done amazing interviews and tests! Let's wait for the good news in January! Use different writing style guides when you write a college essay or another academic assignment. Go to best apps for a college student for help!